Bead and wire jewelry artists create wonderful items of jewelry using a range of techniques. Very often, items of jewelry bought from this type of independent jeweler will be unique. These types of jewelry are sometimes referred to as being 'one of a kind' (also known as 'ooak') and can be bought direct from the maker from galleries and shops, or from craft markets. Many makers also have their own websites, or sell their jewelry through an online store such as Etsy. Working with bead and wire gives the jeweler the opportunity to explore and develop techniques and skills which are specific to this craft. By clever use of a few key tools, jewelry is designed to show off the materials to their best advantage. For instance, a feature might be made of the intricate twists and turns of wire, or an unusual combination of beads. Some jewelers also like to challenge the boundaries between techniques used for working with fibers and textiles, and those used for working with metal. These innovative artists are exploring techniques such as weaving, lace making, crochet and basketry and incorporating them in their work. One interesting artist whose work is truly inspirational and internationally renowned, is Arlene Fisch. Arlene is an extremely well known jeweler and has written on the subject. Her work is featured in galleries and collections internationally, and was shown at SOFA (Sculptured Objects and Functional Art) in 2006. Another well known jeweler is Eni Oken. Eni Oken uses a variety of techniques to create her jewelry. Her website includes lots of photographs of Eni Oken's original style of jewelry, plus an extremely informative blog. Eni also has a comprehensive tutorial section, explaining many different techniques. Artists Online maintains a directory of wire jewelry artists complete with links to their websites where you can see examples of their work and purchase pieces. The bead and wire jewelry artist will create pieces of jewelry using a variety of materials. Often the materials influence the style of the finished item. For example, a necklace made from silver wire with pearl beads will echo the classic, traditional styles of the past, whereas s similar design made from brightly colored craft wire and sparkling beads will have a funky contemporary feel. Wire and beads are available in a range of materials, and different combinations can create wonderful items of jewelry. Some of the most popular are listed in the sections below. Solid Gold: This is very much at the top end of the scale, and many bead and wire artists will only work with solid gold when commissioned to do so or when working some exclusive pieces. Gold Filled: Gold filled wire is a much more cost effective option to solid gold wire. Gold filled wire should not be confused with gold plated wire. The wire is formed from a tube of gold, bonded onto a core of a metal such as brass. The gold is much thicker on gold filled wire than it is on standard gold plated wire. As such, the gold on gold filled wire is extremely unlikely to wear through to the base metal. Gold / Silver Plate: These wires have a thin coat of gold or silver over the base metal. Whilst these wires are low cost, the plating will eventually wear off leaving the base metal exposed. Many wire workers avoid working with plated metals as tools such as pliers can easily nick the plated coating. Silver: There are two grades of silver used in wire and bead jewelry. Fine silver is almost totally pure, and is attractive as it is very slow to tarnish. Sterling silver is made from 92.5% silver mixed with copper, so it can tarnish. Some people, however, feel that this tarnishing enhances the jewelry, and many items of silver jewelry are actually artificially aged to provide an antique finish. Enameled / Craft Wires: These wires are typically copper wire with a colored coating. They are available in a whole spectrum of colors, allowing some beautiful items of jewelry to be formed. Other metals: Copper and brass are also used and can be a popular choice. Some people even believe that copper has health benefits. Glass: Glass beads are used extensively in jewelry. These range from mass-produced beads through to handmade glass beads, which are formed using a technique known as 'lampworking'. These lampworked beads are individually made with no two being absolutely identical. Glass beads are available in a wide range of colors. Wood and Bone: Wood and bone beads are carved into many different shapes and styles. 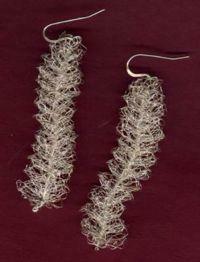 These are often used in ethnically inspired items of jewelry. Crystal: Crystal beads bring a sparkle to a piece of jewelry. These beads are made using a specific technique. There are many manufacturers, however, the most well known is Swarovski. Metal: Metal beads are popular, and can be made from a variety of metals. One of the most popular types of metal beads is Bali Silver Beads. These distinctive beads are traditionally handmade and intricate in style. Gemstones: Precious, semi precious and other gemstone beads are widely used in jewelry. Not only are they available in a wide range of colors, they are also cut in a variety of shapes. Gemstones and pearls are a popular choice, as they look wonderful, extremely hard wearing, and many are said to have mystical attributes. If this has inspired you to make your own jewelry, you will find a lot of information on the internet to help you start. Use a jewelry cleaner to clean your jewelry or wash it in warm soapy water, rinsing thoroughly before drying. Gently polish with a soft cloth to give the metal a shine. Keep silver wire jewelry wrapped when not being worn to help stop the silver from tarnishing.